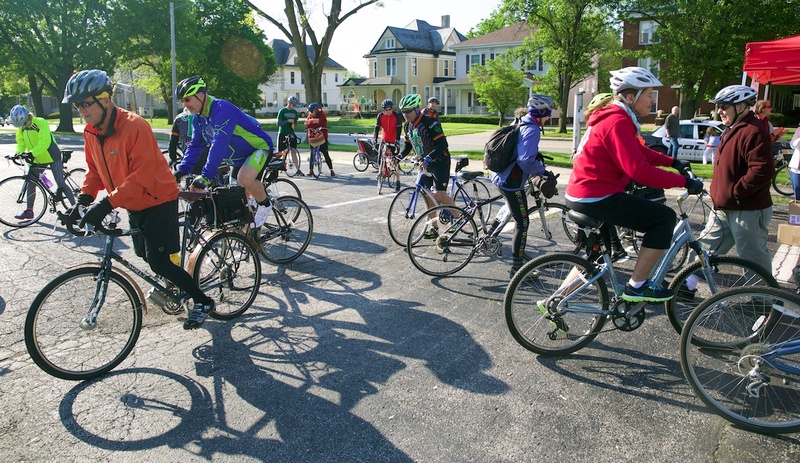 A new bicycle club for Jacksonville, Illinois will be launching next week. Morgan Cyclists bike club’s first ride will be March 25th, starting at 5:30pm at Village Cyclery, 1407 Village Lane, South Jacksonville, IL 62650. The club will have rides every Wednesday — routes of about 15 miles, complete within 2 hours at your own pace. Here’s how to join . . .
Download and complete a membership application. Return by mail or bring to your first ride. Download, read, sign and return the waiver form. Take the LIB online safety quizzes – Adult Cyclist–all three levels (bronze, silver, gold); submit certificate of completion (instructions appear at the end of the quiz). League of Illinois Bicyclists. Here’s the upcoming schedule and other notes from organizer Harry Ford . . .
April 1 – 5:30 – Bahan’s Yeah, right. (Hey, your wheels are turning backwards. Hey, you have a mudstreak up your back. Hey . . . April Fool!) A foolish ride to be determined. April 8 – 5:30 – YMCA lower parking lot. April 15 – 5:30 – Village Cyclery for a taxing taxday ride through the countryside. April 22 – 5:30 – The Soap Co. Coffee House, Earth Day Ride (new info). April 29 5:30 – Village Cyclery Let’s make this a fitness ride, a workout to get ready for the rest of summer. Jacksonville cyclists at the 2014 Town Brook Ride. Remember May is National Bicycling Month – Since 1956 the League of American Bicyclists has promoted May as National Bike Month, a nationwide celebration of all things biking. It makes sense – rites of spring and freedom. And it is an opportunity to showcase the many benefits of bicycling — and encourage more folks to giving biking a try. Whether you bike to work or school; ride to save money or time; pedal to preserve your health or the environment; or simply to explore and have fun, National Bike Month is an opportunity to celebrate the unique power of the bicycle and the many reasons we ride. What can we few do locally to develop awareness or to create an event or simply to entertain ourselves? Weekend Rides in May – We will, in addition to our Wednesday evening rides, do a Saturday morning or Sunday afternoon ride each weekend in May. Anyone have ideas for themed rides, special routes, whatever? Let’s hear them. May 2. Tour de Stooges Lebanon, IL. A fundraiser for the Ridge Prairie Trail Initiative. Group trip? May 6. Bike to School Day. Encourage kids to bike to school today (for starters). May 16. Bike to Work Day. May 20. Ride of Silence. Our Wednesday May 20 group ride will be a bit different. Ride of Silence is a world-wide group ride occurring in thousands of communities simultaneously. It seems that Jacksonville should shed its provincial shell and become part of the world occasionally. This is one occasion. We will honor riders who have been killed or seriously injured in cycling accidents. Details will come. May 24. Bike the Drive. Ride Lake Shore Drive in Chicago WITH NO MOTORIZED TRAFFIC. Surreal, right? The main purpose of the non-competitive bike club will be to get people out to ride. The club will also boost efforts to encourage bicycling in the community and support the Jacksonville Park Foundation. Facebook links to other community cycling groups . . .